If you were to ask me what type of food that I prefer to work with then I’d say chocolate. It’s complex, beautiful, versatile, delicious and quite scientific. After starting reading Peter Greweling’s book about chocolate and confections I was quite apprehensive and daunted by working with chocolate. I read about tempering and how it’s supposed to be something that even professionals struggle with and afterwards I felt like I wouldn’t quite dare to try on my own (which for the record I did once; I overheated the chocolate in the initial heating stage, thought it wasn’t worth continuing the tempering and gave up on the rest of the process and got chocolate bloom), however, I was drawn to the whole world of chocolate with beautiful molded chocolates, dipped centers, delicious fillings, conversations about different cocoa origins and beans, the art of chocolate sculptures and everything else so I felt like I must get over this fear I had because I didn’t want it stopping me. I then quickly made up my mind and on a whim I decided to travel over to Sweden and enrol on three courses on chocolate in Chokladskolan (literally the Chocolate School) in Nora. I decided to go to Sweden because in England there aren’t many courses at all on the subject. You can either do one or two very basic courses or you have to do some long courses that runs over several months to years that also includes pastry work (such as the pastry courses at Le Cordon Bleu in London) that are also very expensive and therefore out of my league. Chokladskolan was therefore the perfect alternative; they offer several courses so you don’t just learn the basics and the quality of the courses are high. They have a bean to bar course and for that one they hire the Hawaiian chocolate bean to bar maker Nat Bletter who is a well known person in the world of chocolate with his Madre company that produces small scale bean to bar chocolate. Said and done. It was a cold and dark morning that I travelled from Stockholm to Nora, the snow was lying on the ground and most people were still in their beds, sleeping. I arrived in Nora after over six hours of travelling and navigated from the final bus stop to the wooden house that Chokladskolan is in whilst a cat was tailing after me. I opened the door and the course leader Ingela Svedbro greeted me. My mouth was stiff from the cold so I couldn’t speak very well but we managed to chat for a bit over a cup of tea together with another student as the remaining two course participants showed up. At Chokladskolan it’s very hands on because of the shortage of time, I think the idea is that you get a quick theory lesson, some demonstrations and then you try it out yourself. You then get feedback on your work from Ingela and then you take all this information you got through demonstrations, theory lessons and the chocolate work you did and go home and practice until you get it just right and then it’s time for the next course with new things to learn. 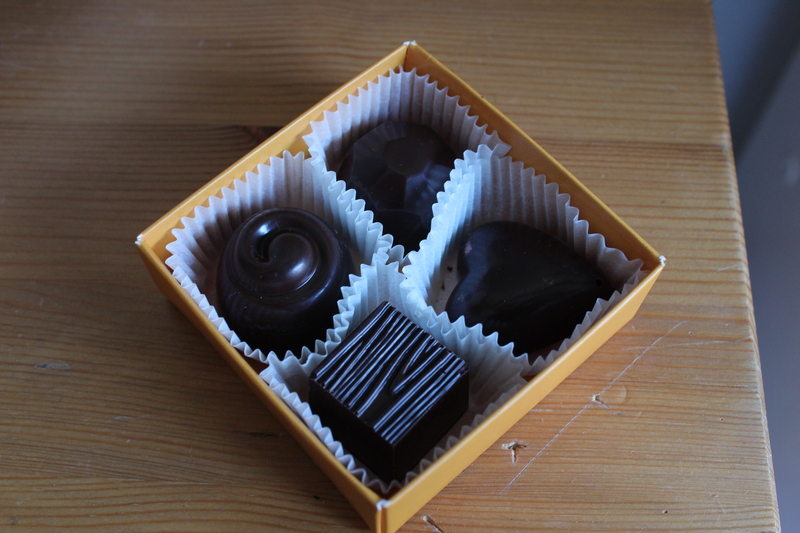 This works well in my opinion, because it means that you can learn how to make good quality chocolates through these short courses, which works out nicely for busy people that work or study and can’t devote themselves to a long full time education. We put on our aprons and our chef hats and Ingela talked through the different chocolate couvertures that we were going to work with. I have never really understood when people talk about different origins of chocolate and the different notes they have depending on where the beans come from, but I immediately noticed a difference now, it was like a new world opened up for me. I think perhaps it was because the chocolate I’ve eaten in the past has been mainly cheap chocolate whilst this was top quality. We tried Michelle Cluizel’s chocolate from a plantation called Maralumi (or possibly Mokaya), from a plantation called Los Ancones and from a plantation called Vila Gracinda. These all have similar cocoa contents, 64, 67 and 67% but tasted very different. The first was very fruity and sweet, the latter was fruity but slightly tangy as the same time and the latter was quite bitter and smoky in my opinion. My group chose to use the chocolate from Los Ancones. We were taught how to make a ganache filling for the chocolate shells using cream, chocolate, butter and flavourings. We decided to make the fillings with peppermint oil, Calvados and cassia, Amaretto and lastly dried raspberry powder. The filling was quite easy to make, what I really came to the school to get better at was the tempering and making the shells. We used microwaves to heat up the chocolate because it’s easy to get water in the chocolate if you’re using a bain Marie. Why do you need to temper chocolate? It almost deserves an entry of its own but in short it’s because chocolate is polymorphic which means that just like carbon, chocolate can have vastly different characteristics depending on how the molecules sit together (or atoms in the case of carbon). Imagine graphite, that’s how chocolate is if you haven’t tempered it, it’s soft and bendy, no shine and no snap, but if you are to temper it you get something like diamond; very shiny, hard with a snap and holds it’s shape. After heating the chocolate you have to cool it down while agitating it somehow, there are various ways to do this but at Chokladskolan we used the tabling method which is the classic one where you cool it down on a marble slab with a spatula. We then transferred the chocolate back to the bowl and heated it slightly again. Now when your chocolate is in temper you have to work fast, which is something I have to practice on. We were shown how to make the moulded shells. In short you pour chocolate over a polycarbonate mould, scrape it off and then shake the mould or hit it against the work top to get rid of air bubbles in the chocolate. You then simply flip the mould upside down and shake off the excess chocolate. You then scrape off more chocolate as you’re holding it upside down, put it on metal frames to let it set for a few minutes and then scrape it off again once the chocolate is set. We piped our filling into the shells and normally you’d let the chocolate sit for at least a day so that the filling is completely set before you seal off the chocolate bottoms with more chocolate, but we didn’t have time so we had to do it today. This is the hardest part of it all in my opinion; getting pretty bottoms. We poured chocolate over the moulds again and scraped it off, but as we scraped little holes emerged here and there, because the chocolate got cold so fast. You let the moulds sit for a few minutes and then you transport them to the fridge, to release latent heat that otherwise might cause the chocolate to bloom. If your chocolate is correctly tempered it should shrink back slightly from the moulds which ours did. We gathered around our teacher as she flipped one of the moulds up side down and watched as the chocolates fell out. Shiny and pretty! This entry was posted in Chocolate, Chokladskolan and tagged chocolate, chocolate course, Chokladskolan, Chokladskolan Nora, Nora. Bookmark the permalink.